Artistic Iron Works in, Regina, Saskatchewan, Canada is a supplier of easy to assemble, do-it-yourself steel gate frames and gate braces for fence gates. Two great choices to choose from available in many size options. Artistic Iron Works in, Regina, Saskatchewan, Canada is a supplier of easy to assemble, do-it-yourself steel gate frames and gate braces for fence gates. Two great choices to choose from available in many size options. Gate Frames & Gate Braces are steel frames and braces that enable you to build a strong, lasting gate. Wrought Iron Gates are complete gates that you simply install, then bolt on an ornamental design. complete details on each of our different gates. 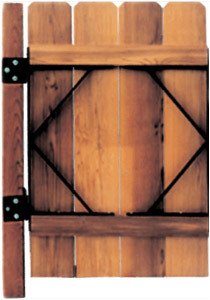 These Gate Frames can build a gate up to 6 ft wide and 4, 5, or 6 ft high. Set of 4 braces used with four 2x4's to support most gates. 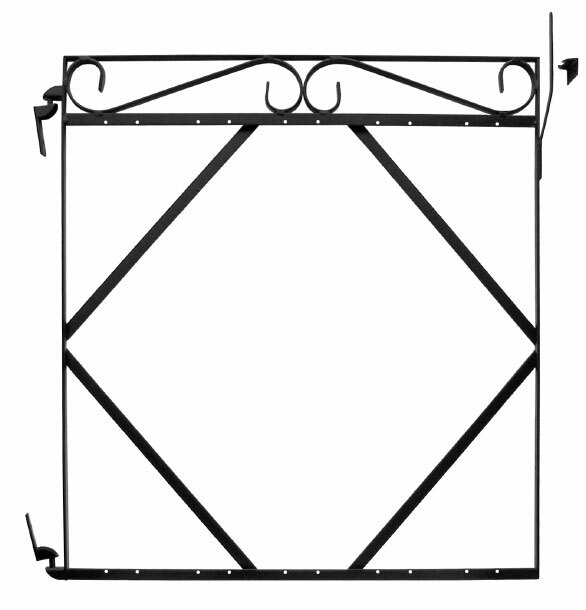 Just place your pickets in this ornamental frame, for a 42" wide gate, 43" or 55" high. 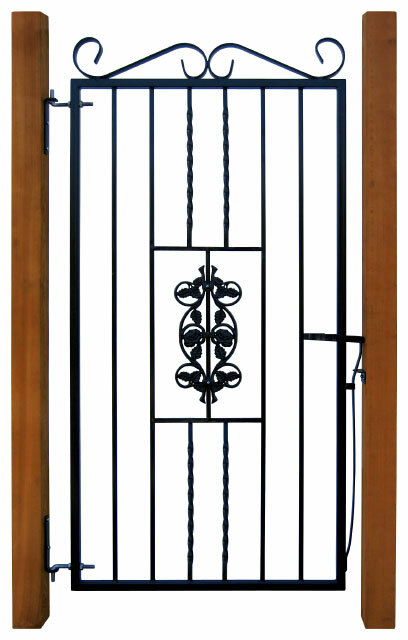 Iron gate 42" high for 36, 40, 44, 48 or 52" openings with P4 design bolted in. Iron gate 64" high for 36 40, 44, 48 or 52" openings with P7 design bolted in. 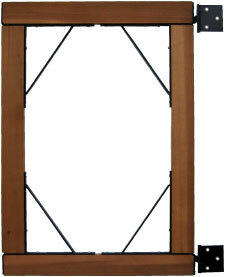 These GATE FRAMES with attached hinges are strong, durable and easy to use. Simply cut two - 2x4�s, two inches shorter than the opening. Bolt on GATE FRAMES, nail on boards and hang your gate. Use two pair of frames for double gates. Recommended width 28 to 72 inches. Need Help? Click here for our help/order desk. Wood pickets, freight & taxes extra. Use two sets of frames for double gates! 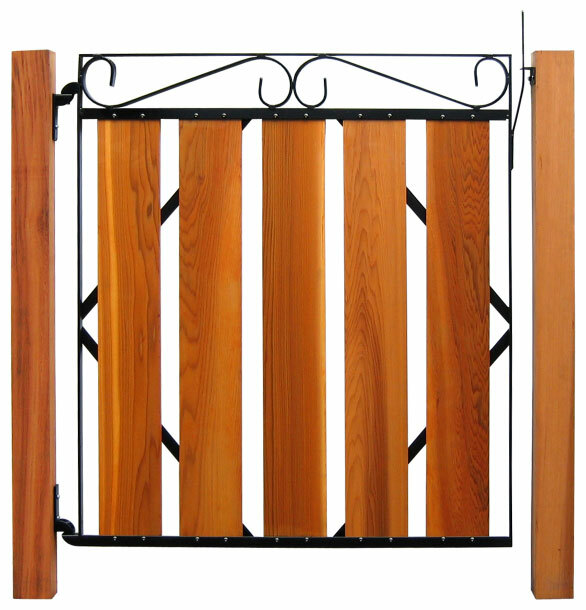 Artistic Steel Gate Braces enable you to build a strong gate frame, using four 2 x 4�s. Simply cut two 2 x 4�s two inches shorter than your gate opening -- they are used for the top and bottom of your gate frame. Now cut two more 2 x 4�s for the sides of your gate frame -- these will set the height of your gate frame. Suggested length is 25 1/2 inches shorter than the pickets you are using. If you cut the inside ends of the 2 x 4�s on a slight angle, you will get a tighter fit, (see assembling picture below). Now screw the 2 x 4�s to the Gate Braces, nail or screw your pickets to the top and bottom 2 x 4�s. Your gate is ready to hang. Click here for our help/order desk. Then leave a 42" opening for your walk in gate and save five pickets. Then you can use this strong, beautiful ornamental gate frame and save big time. Then reset the opening for your walk in gate to 42 inches and purchase five pickets. Then you can use this strong, beautiful ornamental gate frame and save big time. Gate is hinged on the left as you approach the clear side... the other side shows the cross-braces. 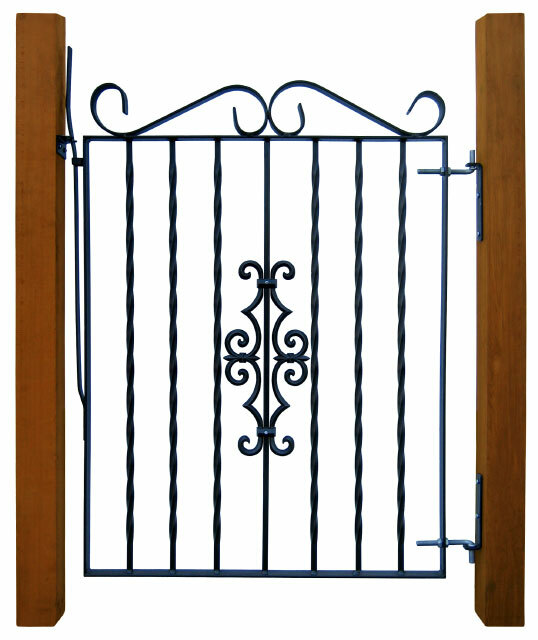 Artistic Iron Gates are 42 or 64 inches high and fit openings of 36, 40, 44, 48 and 52 inches wide. The opening is the Inside Distance between the posts. The gate is made 5" smaller than the opening to allow for the hinges and the latch. The adjustable hinges will allow for approximately 1" adjustment each way. The hinges, latch and hardware are supplied. These gates must be installed between the posts, not to the surface (See pictures). These gates will take one ARTISTIC BOLT IN DESIGN (sold separately). Paint is a black primer coat. Customer to supply total opening measurement (post to post). Picture shows Standard Gate 42 inches high with P4 design added. Picture shows Standard Gate 64 inches high with P7 design added.